Every Sojourn Adventures participant is required to complete a liability waiver. Sojourn Adventures has more than 18 years of experience strengthening teams and companies in the greater Atlanta area. Below are some frequently asked questions to help you prepare. + Where Will Our adventure take place? Sojourn is a ministry of Perimeter Church – 9500 Medlock Bridge Road, Johns Creek, GA 30097. Unless this is an off-site program, all adventures take place on Perimeter's property. Once you arrive on site, all groups will meet at the Outdoor Covered Pavilion unless otherwise noted. It’s located on the opposite side of the parking lot from the church, near the swimming pools and tennis courts. Click here to be directed to the meet up spot in maps. + As a participant, What Should I wear? For your safety, Sojourn Adventures requires closed-toed shoes. Unless otherwise noted, all adventures occur outside, so dress appropriately for the weather, and wear items you don't mind getting a little dirty. + As a Participant, What Should I Bring? Participants under the age of 18, should bring a printed confirmation that the online waiver was signed by a parent/legal guardian (liability waiver) . Water is available on site, but we recommend that each person bring a water bottle. Leave your valuables (jewelry, nice watches, wallets) at home or in the car. + As a participant, what should I expect? While adventure activities inherently contain some level of risk, our primary responsibility is the physical and emotional safety of all participants. Plan to participate in fun, yet challenging activities designed to meet the objectives of your group, but as a participant, you will choose your level of participation and will not be forced into anything you choose not to do. Some activities require physical stamina while others are mental challenges. Some activities take place on the ground and others are high in the air (depending on your groups goals). Throughout your experience we'll stop to talk about what you are learning and how it applies to life. The financial investment varies depending on the length of your adventure, size of your group, and the activities necessary to attain certain group goals and objectives. For full pricing and further details about booking an event, please contact us. + Can I tour the facility? Absolutely! Use the contact form on our site to request a time to visit and discuss your needs. + Can individuals sign-up without a group? No. Sojourn is focused on strengthening teams and growing leaders within those teams. All programs are designed for pre-existing groups (sports teams, discipleship groups, mission teams, schools, companies, etc.) who are eager to challenge themselves. 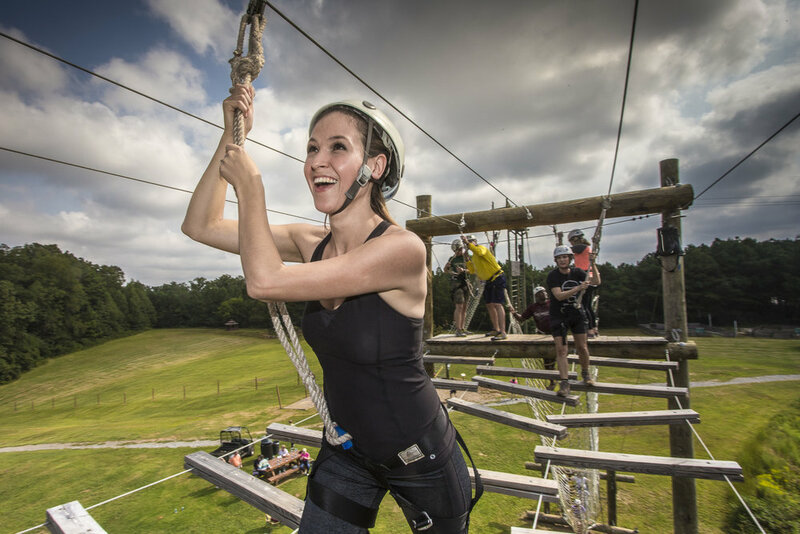 We're not seeking to entertain your birthday party, give you a fun ride down the zip-line or help you become a great rock climber. + What is the length of a Sojourn Adventure? Program length depends on your group goals and objectives. Most events are between 3-8 hours, but can be lengthened to full day, multi-day, or multiple sessions depending on your needs and objectives. + What if some people are afraid of heights? It's very common that groups will have some individuals who prefer not to get off the ground. All our programs operate within a framework of individual choice, where we never force individuals to complete activities against their will. Our intent is to create environments where all participants feel safe to participate OR to opt out of certain activities. In addition we can always customize programs with little/no high adventure activities involved if you prefer. + Can we do a full laser tag event? Yes! Sojourn Adventures has the most technologically advanced outdoor laser tag equipment around, shooting up to 1,000 feet in daylight. We are currently able to accommodate up to 30 players at one time with a variety of playing fields and scenarios on site. Laser tag is available on our property or off-site. A typical event lasts 2 hours and includes a full equipment briefing followed by 4-5 short games. The "lasers" used in laser tag are equivalent to the signal coming from your TV's remote control. They are invisible to the naked eye and cause no pain or harm. + Will a large group be able to stay together? It depends on the goals and objectives of your group. The ideal group size for many activities and group discussion is 8-12 people. It's common that large groups will spend a portion of the day in small teams, each having their own facilitator, then coming back together for a portion of the event. Decisions on the program format will always be discussed in detail with the group leader prior to an event. + Are there age restrictions? + Are there weight restrictions? There is no maximum weight for participating in low ropes activities. For high ropes activities, we operate with a maximum weight of 275lbs for most activities. Don't worry - the capacity of all elements and gear is far greater than this weight in order to operate within the standards of our industry. + Can I participate if I am pregnant? First of all, congratulations! Participation in activities that take place on the ground is permitted only with permission from your doctor. Any activity that takes place off the ground or requires the use of a harness is not permitted. Each deposit is fully refundable, minus a $25 processing fee, if cancellation is received 14 days prior to event start date. Groups may be rescheduled (as course availability permits) without penalty outside of the 14-day mark, groups rescheduled within the 14-day mark will incur a $5 per person rescheduling fee due at time of rescheduling. No refunds or reschedules will be made within 7 days. Guests who fail to show up are responsible for the full course fee. Sojourn maintains the right to cancel or deny any requests as determined by the leadership of Sojourn or Perimeter Church. + Are you a part of Perimeter Church? Yes. Sojourn Adventures is a ministry of Perimeter Church. All of our staff are followers of Christ and we strive to lead programs according to Biblically based principles. About half of the events we lead are faith based and about half are not. We work with groups of all types from all over our community and are able to incorporate a Christian focus into an event, but we also respect that not everyone desires this. Each program begins with a brief intro designed to both invite questions about the church for anyone who's interested, but also inform the group that they won't be pressured about things from a spiritual perspective during the experience. + Can Sojourn Adventures Cater An Adventure? Yes! Let us coordinate a meal or snack for your group. We have several catering options to meet the needs of any group. Have dietary restrictions? Picky eaters? Big eaters? No problem. + Do you have meeting space available on site? We sure do! Whether you desire to plan a meeting inside before, after, or as an integral portion of your team building program, we have a variety of meeting spaces available. In addition, indoor activities can be utilized for many groups as an inclement weather back up or as pre-planned portion of your adventure. + What is available to groups off-site? Contact us regarding your specific situation. One of our expert program designers can work with you to create the perfect program to meet the needs of your group. Sojourn is able to provide offsite programing including team-building events using portable group initiatives, as well as tactical laser tag. Don’t know where to start? We’ve designed a guide to help you plan your team’s perfect day. Help Me Plan - Send it Over! Check out our most popular options and let us help you design the most beneficial adventure. How Much Growth Will Your Team See?